I love watching seeds grow. It feels like magic, or more like a creative miracle. God hard-wired seeds to develop into specific plants. What a mystery. There are other methods to grow new plants. I take cuttings of a plant and dip it in hormone powder, which stimulates root growth. After I plant it, the roots quickly grow and I have a new plant! Every method of propagation delights me. 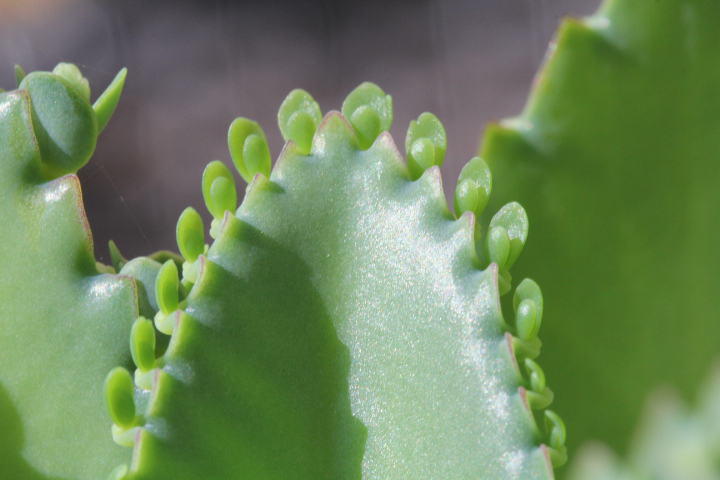 I recently noticed that my new succulent developed little growths on the edges of the leaves. I looked closer and found that these growths looked like little plants. Some of these plants fell off. They had miniscule roots ready for beginning a new life in available soil. I pulled more of these babies off the leaves and put them in the pot with the mother plant. It wasn’t long before these were adorable little succulent plants. There comes a time in our lives when we need to get rooted for ourselves. Kids in Christian homes live off the faith of their parents, but at some point they need to have a secure faith of their own. They need to be in the Word, reading the Bible for themselves creating their own root growth. Adults who become Christians also need to dig in and develop their faith and not just depend on someone else for guidance. When we take responsibility for our spiritual growth, we become strong and take on the characteristics of a mature Christian. I volunteer leading a Bible Study for addicts. Many are new believers. We spoon-feed them the gospel, but at some point they have to go deeper for themselves. They have to pursue a radical Christian walk and have faith to carry it on past the time when they are in our program. Some Christians go to church and are spoon-fed the gospel. They don’t feel the need to study the word for themselves. They don’t stretch their independent faith in their walk with the Lord. I fear for their continued Christian walk. Their roots are not deep and if they would fall off the mother plant, they would die. So these baby succulents gives a simple message for this day. Get planted in the Word. Grow your roots.